We have nice, clean restrooms, a large picnic area, free ice water, and we love groups! And you won’t find a more manicured U-Pick farm anywhere – it’s so nice in our fields that you can pick barefoot and in shorts. Hope to see you soon! You may encounter bees, wasps, ants and other stinging and biting insects so you may want to wear some bug repellent. Although most of our blackberries are thorn-less, there is one variety (1 row) with thorns so watch for those. Don’t cut through or across planted rows as you will encounter low trellises, fencing and uneven ground with holes, ruts and ridges … so stay in the beautifully manicured picking lanes and you’ll be fine. Be alert for hazards so you can avoid them. No smoking allowed while picking (only in designated area). Hat, boots and sun screen are recommended. Drink plenty of water (free ice water is available). Return to the fruit stand if you hear thunder. Refrigerate fruit as soon as possible. 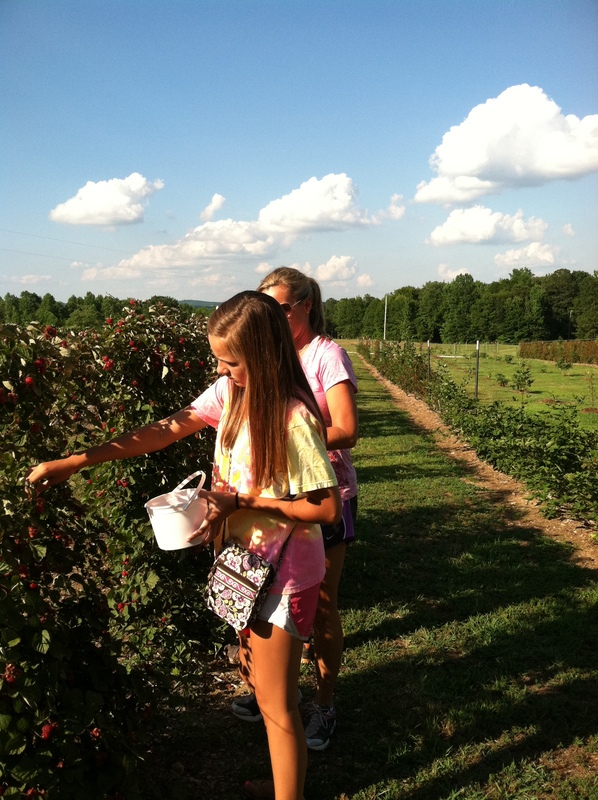 Picking fruit at our farm is done at your own risk and Holmestead Farm will not be responsible for any injuries or harm sustained as a result of your activities while on the farm. If you would like to purchase additional fruit after your bucket is filled, we will be glad to store what you have picked in our cooler while you return to the fields to pick. Once you return home store fruit in your refrigerator and wash prior to eating. To freeze, put in a single layer on a cookie sheet in the freezer. Once frozen transfer fruit to a zip freezer bag. Do not wash until just prior to eating. Immediately refrigerate fruit, do not leave in a warm car and chill within an hour of purchase. Store fruit and vegetables in the refrigerator above raw meats and poultry or in a crisper drawer so that juices from the meat will not drip on them. Always wash your hands before preparing fruit for eating. Ensure that all work surfaces, including cutting boards and utensils, are clean and sanitized using a mild bleach solution (1 1/2 teaspoons of household bleach per quart of water). Wash all fruit with cool running, drinkable water. Using soaps or household detergents is not recommended for washing fruit as they can leave unacceptable chemical residues. Fruits keep better if washed just prior to use, however, if children are likely to snack on fruit from the refrigerator, wash fruit before being stored in the refrigerator. Blueberries do well going straight from picking to the freezer.